WITH BRANDY IN IT. It has brandy in it, but I felt like the title would slap my face if I included that. This galette is a major problem, guys. My whole vision was a holiday appetizer. You make one, you slice it up, and you serve tiny, adorable pie-shaped slices on a platter to your friends and neighbors and family and I ATE THE WHOLE THING. I think it’s the brandy. This is the funny thing, the brandy was a last-second splash, so it’s not in this layout. Because can we just look at all that right up there? 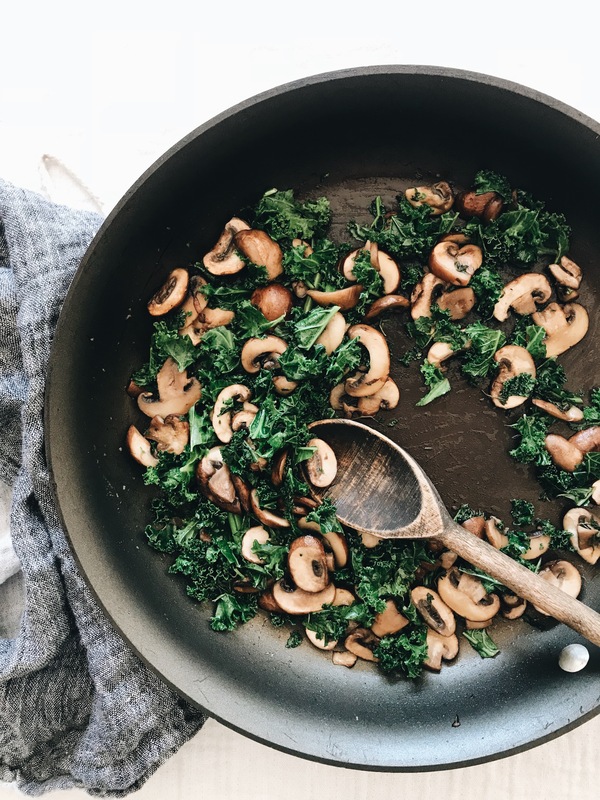 First of all, chopped kale + mushrooms = the meaning of life. You’ll never experience anything more fulfilling. UNTIL YOU ADD ROTH’S GRAND CRU ALPINE-STYLE CHEESE. And then it’s all over for you. Listen to me, if you’ve never had Roth’s Grand Cru, let me learnt ya. It’s not as buttery as say, a cheddar. But it’s not as hard as say, a parm. It’s this ALPINE-STYLE cheese made in Wisconsin that’s a teensy bit floral, but also super mellow yellow. And it grates really beautifully. And melts over mushrooms and kale like whoa. All you’ll do is sauté a small carton of sliced baby bellas in a pat of butter with some fresh thyme leaves. It already smells so good in your kitchen at this point you’ll want to stop and stick your face in the pan forever. So add some kale super fast so that you don’t! Because it would burn your face. Then add that tsp of brandy and SMELL THAT. But seriously, don’t stick your face in the pan. I thought we went over this. Next you’ll just roll out one of those circle refrigerated pie crusts and slap dat filling right on in. Oh oh! – Layer a little of the shredded Grand Cru under the veggies. I feel like this acts like a SEAL. Not like, a seal. 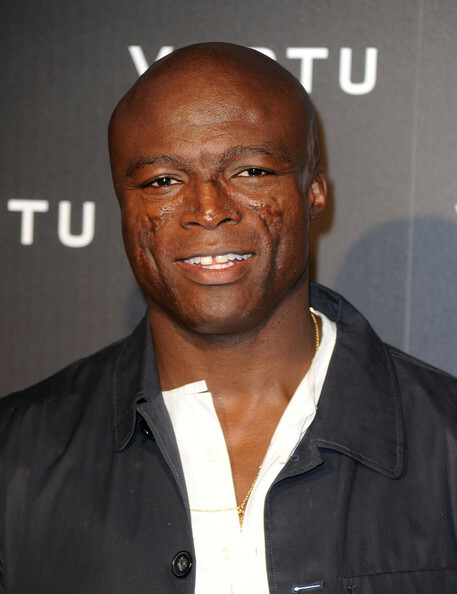 Or Seal. 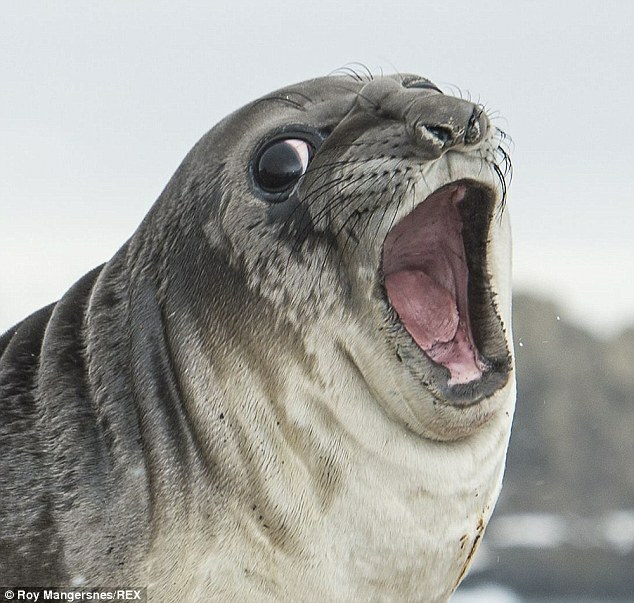 But a seal. That Grand CRU, y’all. 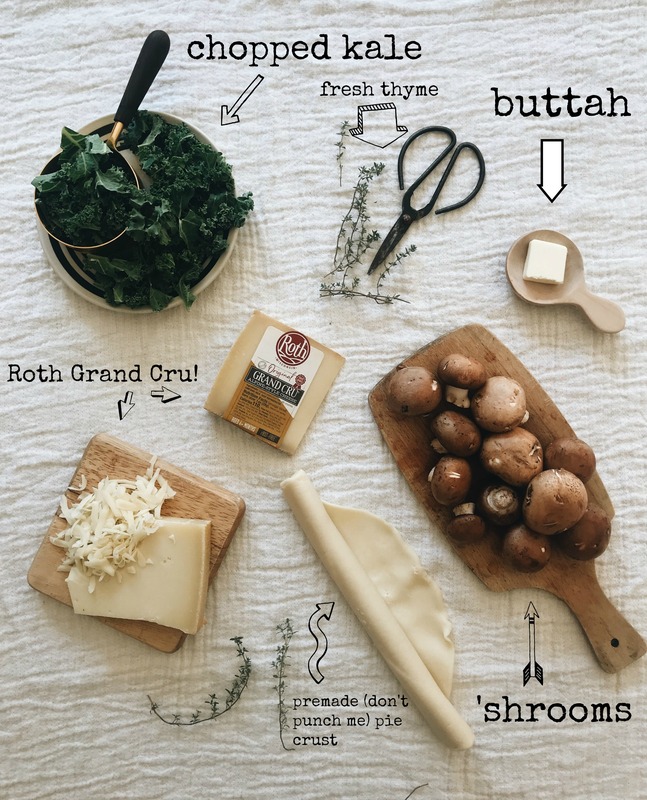 Because the mushrooms and kale (and brandy) are so earthy together, that mellowness of the cheese just SCREAMS. But it’s a mellow scream. Like a yip. Or a peep. A squeak. Holiday appetizer? Or in your face now. You decide. In a large skillet, melt the butter and olive oil over a medium-high heat. Add the sliced mushrooms to the pan and sauté for about six minutes, until they deepen in color all over. Season with a pinch of salt, pepper, and thyme leaves. Then add the chopped kale and sauté until the kale begins to wilt, just a couple of minutes. Add the brandy and give it a stir. Roll out the pie crust on a work surface. 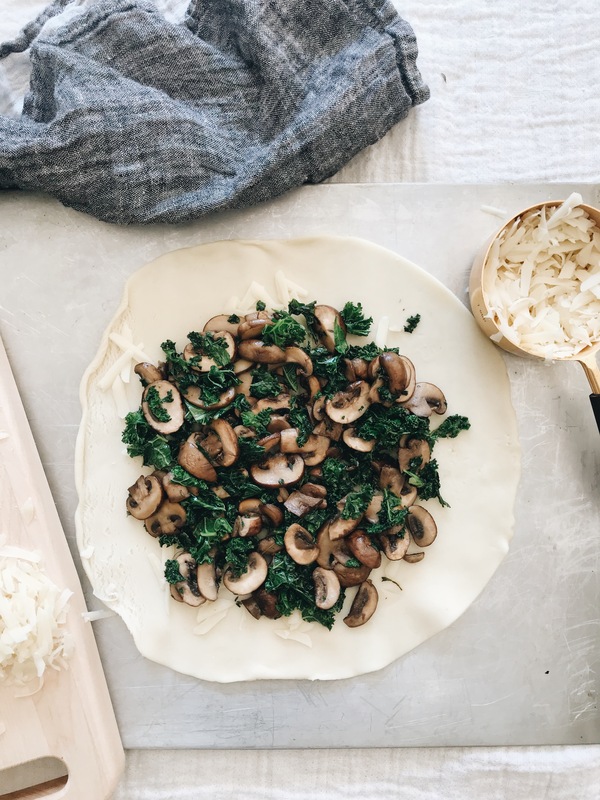 Sprinkle about half a cup of the grated cheese in the center of the crust, then top with the mushroom and kale filling. Top with the remaining Grand Cru cheese. 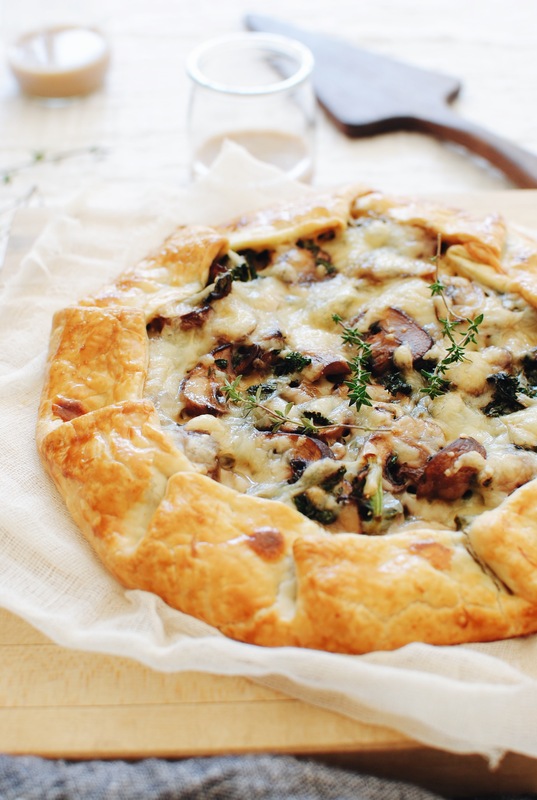 Fold the outer edges of the pie crust over itself, forming a galette. Brush the outer edges with the egg wash, then bake for about 30 minutes, or until the cheese is browned and bubbly, and the crust is golden brown. Garnish with more thyme, slice and serve! Yeah, in your face now. Love Running? Except When You’re Actually Running? There’s an App for That. Oh my god..right up my flavor alley. Will have to try this soon. Wow! This looks SO GOOD! Thank you! I printed the recipe and I'm trying it on Thanksgiving. I'll make 2, just in case I eat one. Ha ha!! 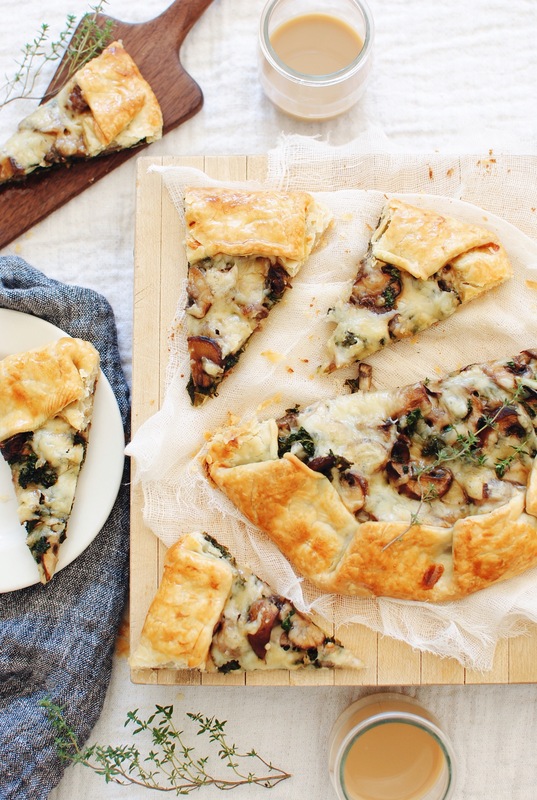 LOVE that you used refrigerated pie crust...saving me those steps had me totally on board!! I mean, my toddler could get into all sorts of shananagins while my hands were covered in dough! 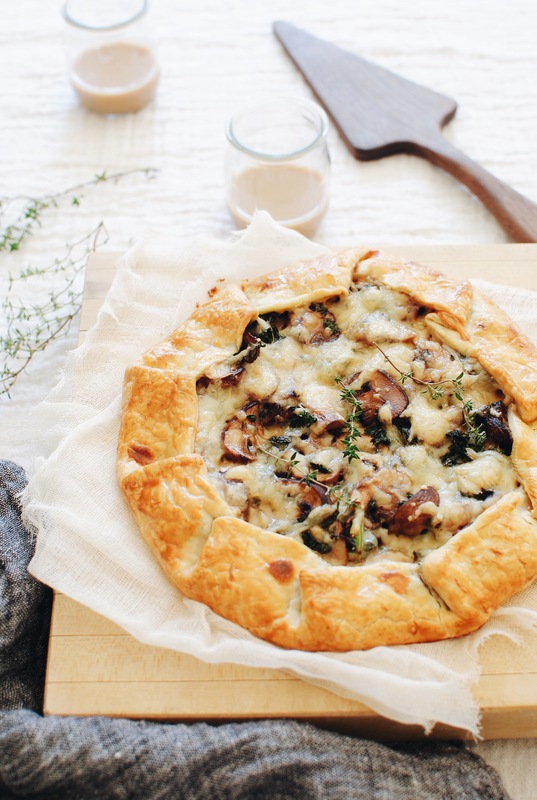 This galette looks lovely and delicious and I want to make it right now but WHAT is in those glasses I HAVE TO KNOW. It's weirding me out. 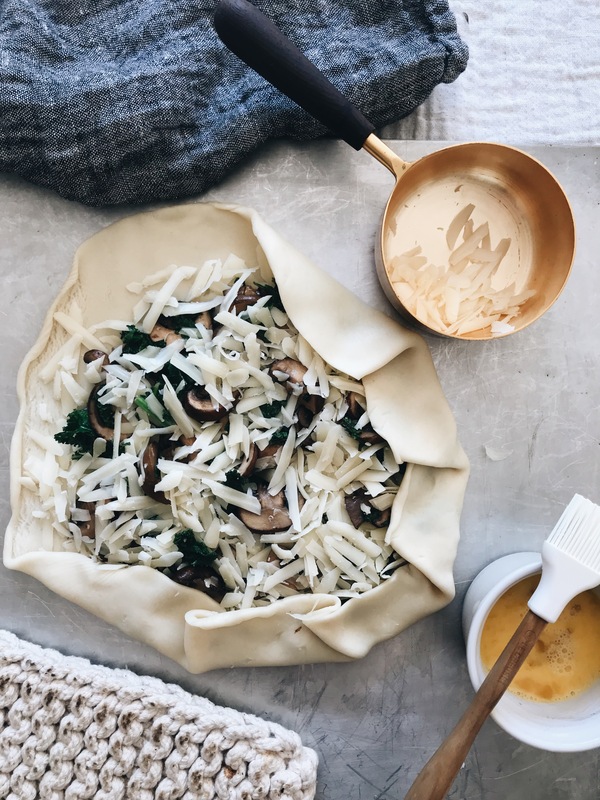 I'd eat the whole thing too, love this, great set of ingredients, but great serving idea with galette instead of what I'd usually make with these ingredients, a quiche, so thank you for this recipe, love it! Hi Bev...! these looks amazing & perfect, and so yummy food thanks for these. I will trying to making this recipe like you... Bev ! These are my flavors. I know I could eat it every day. Thumbs up for a look. 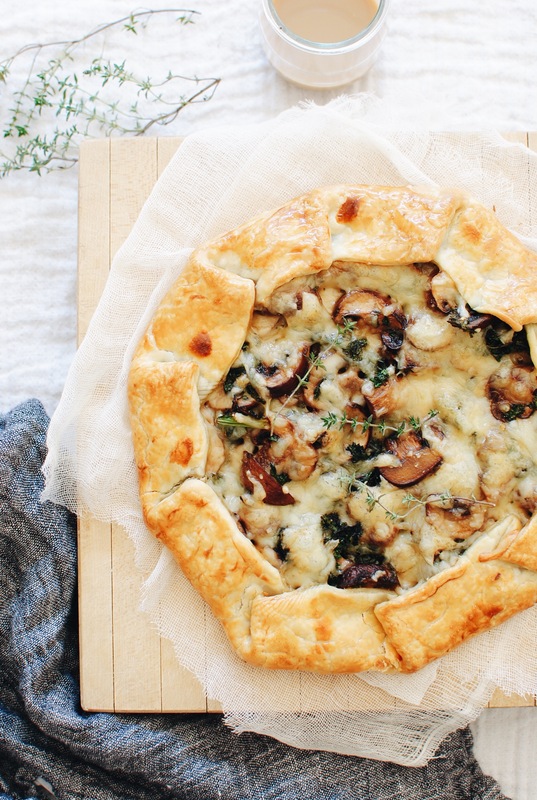 Everyone just said it how excellent, fantastic, amazing this galette looks. I had to say it too: looks delicious, mouthwatering !!! Can you make this ahead of time, and just reheat prior to serving?! Bev, do you put the Galette on a sheet pan and then stick it in the oven or does it go directly on the rack? Thanks! This was beyond excellent. I made a sour cream butter crust as I wasn't too thrilled about going out for pre-made. Everything came out perfect and beautiful to look at. Thanksso much for sharing this recipe.